Definition at line 68 of file maxwellChM.h. Definition at line 44 of file maxwellChM.C. Definition at line 72 of file maxwellChM.h. This function computes the moduli of individual Maxwell units such that the corresponding Dirichlet series gives the best approximation of the actual relaxation function. tStep Age of material when load is applied ??? Definition at line 49 of file maxwellChM.C. 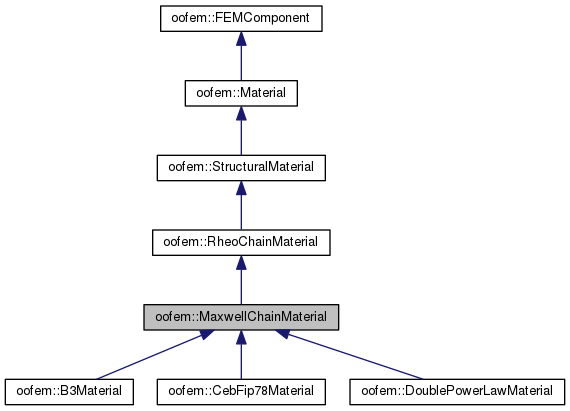 References oofem::FloatArray::at(), oofem::FloatMatrix::at(), oofem::RheoChainMaterial::computeDiscreteRelaxationFunction(), oofem::RheoChainMaterial::giveCharTime(), oofem::RheoChainMaterial::giveCharTimeExponent(), oofem::RheoChainMaterial::giveDiscreteTimes(), oofem::FloatArray::giveSize(), oofem::RheoChainMaterial::nUnits, and oofem::FloatMatrix::solveForRhs(). Definition at line 201 of file maxwellChM.C. References oofem::FloatArray::add(), oofem::FloatArray::beProductOf(), oofem::RheoChainMaterial::computeTrueStressIndependentStrainVector(), oofem::RheoChainMaterial::giveCharTime(), oofem::RheoChainMaterial::giveCharTimeExponent(), oofem::RheoChainMaterial::giveEparModulus(), oofem::RheoChainMaterialStatus::giveHiddenVarsVector(), oofem::FloatArray::giveSize(), oofem::Material::giveStatus(), oofem::StructuralMaterialStatus::giveStrainVector(), oofem::TimeStep::giveTargetTime(), oofem::StructuralMaterialStatus::giveTempStrainVector(), oofem::TimeStep::giveTimeIncrement(), oofem::RheoChainMaterial::giveUnitStiffnessMatrix(), oofem::RheoChainMaterialStatus::letTempHiddenVarsVectorBe(), oofem::RheoChainMaterial::nUnits, oofem::RheoChainMaterial::relMatAge, oofem::FloatArray::subtract(), oofem::RheoChainMaterial::timeFactor, oofem::FloatArray::times(), and oofem::RheoChainMaterial::updateEparModuli(). gp Integration point where newly created status will be stored. Definition at line 251 of file maxwellChM.C. Class name of the receiver. Reimplemented in oofem::B3Material, oofem::CebFip78Material, and oofem::DoublePowerLawMaterial. Definition at line 80 of file maxwellChM.h. Computes, for the given integration point, the strain vector induced by the stress history (typically creep strain). tStep Time step (most models are able to respond only when tStep is the current time step). Definition at line 144 of file maxwellChM.C. References oofem::FloatArray::add(), oofem::FloatArray::beProductOf(), oofem::Material::castingTime, E, oofem::RheoChainMaterial::giveCharTime(), oofem::RheoChainMaterial::giveCharTimeExponent(), giveEModulus(), oofem::RheoChainMaterialStatus::giveHiddenVarsVector(), oofem::TimeStep::giveIntrinsicTime(), oofem::FloatMatrix::giveNumberOfRows(), oofem::FloatArray::giveSize(), oofem::Material::giveStatus(), oofem::TimeStep::giveTimeIncrement(), oofem::RheoChainMaterial::giveUnitComplianceMatrix(), oofem::RheoChainMaterial::nUnits, OOFEM_ERROR, oofem::FloatArray::resize(), oofem::RheoChainMaterial::timeFactor, oofem::FloatArray::times(), and oofem::FloatArray::zero(). Evaluation of the incremental modulus. Definition at line 105 of file maxwellChM.C. References oofem::Material::castingTime, E, oofem::RheoChainMaterial::giveCharTime(), oofem::RheoChainMaterial::giveCharTimeExponent(), oofem::RheoChainMaterial::giveEparModulus(), oofem::TimeStep::giveIntrinsicTime(), oofem::TimeStep::giveTargetTime(), oofem::TimeStep::giveTimeIncrement(), oofem::RheoChainMaterial::nUnits, OOFEM_ERROR, oofem::RheoChainMaterial::relMatAge, oofem::RheoChainMaterial::timeFactor, and oofem::RheoChainMaterial::updateEparModuli(). Computes the real stress vector for given total strain and integration point. The total strain is defined as strain computed directly from displacement field at given time. The stress independent parts (temperature, eigenstrains) are subtracted in constitutive driver. The service should use previously reached equilibrium history variables. Also it should update temporary history variables in status according to newly reached state. The temporary history variables are moved into equilibrium ones after global structure equilibrium has been reached by iteration process. answer Stress vector in reduced form. For large deformations it is treated as the second Piola-Kirchoff stress. reducedStrain Strain vector in reduced form. For large deformations it is treated as the Green-Lagrange strain. tStep Current time step (most models are able to respond only when tStep is current time step). Move this to StructuralCrossSection ? Definition at line 191 of file maxwellChM.C. Computes, for the given integration point, the strain vector induced by stress-independent shrinkage. tStep Time step (most models are able to respond only when tStep is current time step). mode Determines response mode (Total or incremental). Definition at line 83 of file maxwellChM.h. If only incremental shrinkage strain formulation is provided, then total shrinkage strain must be tracked in status in order to be able to compute total value. Definition at line 95 of file maxwellChM.h. Returns nonzero if receiver is non linear. Definition at line 79 of file maxwellChM.h. Definition at line 258 of file maxwellChM.C. Referenced by oofem::DoublePowerLawMaterial::initializeFrom(), oofem::CebFip78Material::initializeFrom(), and oofem::B3Material::initializeFrom().